Where have I been? Do inquiring minds want to know? Probably not. 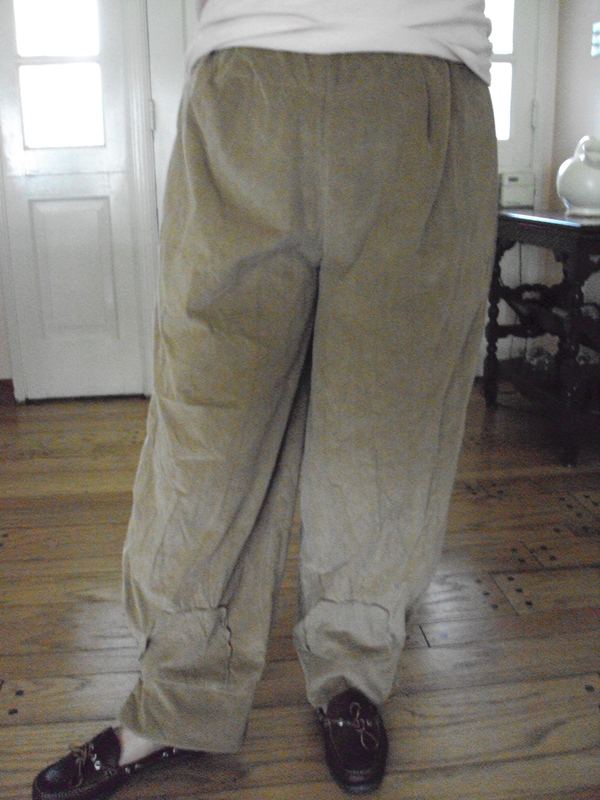 3) I sewed up a wadder, which took with it all my sewing confidence. But other than that, everything else is great. I really, really wanted to love this book. I really did. Once I got my grubby hands on it (Thank you Amazon!) All I wanted to do was to sew every single garment from it. I wanted to transform my wardrobe from miscellaneous garments that don’t really go together to a wardrobe that everything fits in style, in fabric and in the unique Lagenlook (layered look) fashion that is this book. I sewed only one garment from it and it is awful. A true wadder! Yuk! That is all I can say about these pants. Just yuk! After looking at the photos of the pants and then looking at the pants I sewed. I guess, they aren’t really that much different, other than I like the pants on the model and I dislike the pants on me. I also down loaded one other pattern – the simple tunic top. I taped the pattern pieces together and then rolled it up and shoved it into my fabric closet and that’s where it has been for the last few weeks. I had thought I would sew every garment in this book. And why not? The clothes are of the Lagenlook variety, which I love, which I have several pieces already in my wardrobe- RTW pieces. So to find a book with the Lagenlook style clothes and patterns, too – such a plus! Also the garments highlight wonderful buttons. I have lots of really unique buttons but I don’t have a huge quantity of any one style of button so this seemed like a perfect match: unique designed clothes and a reason for me to prowl through my button stash. Downloadable patterns. All the patterns are contained on accompanying CD. Once I printed the pattern out, taping it together was a mess. Pattern garment lines didn’t match. The grid pattern on the pattern didn’t match. The numbering system on the pattern didn’t match either (some have numbers some do not). It was a disaster. And sewers complain about tracing Burda patterns. Pfft! After this experience, tracing a Burda pattern is a breeze. So there was my first issue (and I should have stopped there, but didn’t). I should also mention that the garments are sized by range. For instance: 8-10 is a small, 12-14 is medium, etc. When garments are sized in ranges it usually means that the garments have lots of ease – maybe too much ease. And finally, my choice of material. There is something to be said about the marriage of pattern and fabric. When it’s a good match – all is well and happiness reigns – particularly for the sewist. And when it is not a good match? Ugh. Yep. I choose the wrong fabric. So what’s my conclusion regarding this book. This book is NOT for beginners, and, if you have read this far, obviously not for a seasoned sewist like myself! There are too many omissions: like croquis of each garment, seam allowances – still haven’t found that information, plus a few mistakes in the text of the book (like the bag pocket reference is incorrect) and the whole downloading patterns from the CD. Maybe this task isn’t impossible, but it sure is a pain in the you-know-what! However, now that I am done with my complaining, if a Lagenlook garment is what you crave, then in this book is an entire wardrobe of these unstructured garments, begging to be sewn. This book really is wonderful sewing eye candy and I do like to look through it again and again and dream of what could have been. « My quest to make a garment from every Burda Style Magazine in 2013 continues! Ugh. I completely feel your pain. Looking forward to something that turns out to be the worst thing ever is a let down of the first degree. I do hope your next (current?) project is worth every stitch! Thanks! I am definitely moving on to better sewing! Aw, sorry to hear of your “wadders”. (I do love that term though, lol). I know what you mean about downloadable patterns. I have ALWAYS had a problem a) lining up the pattern lines and b) printing out the pattern to the same scale is it is supposed to be. i.e., when they say “print out this square to 2.5 cm X 2.5 cm, mine is always off by a cm this way and half a cm, that way, etc. I follow all the printer settings directions, not scaled, etc. but still…it just doesn’t print out as it it supposed to. And this is why I won’t be buying any more downloadable patterns. I tried a download pattern once. and never shall it happen again. If a pattern is only downloadable I now pass on it. I don’t want to even try. I just got this book last weekend and LOVE it! I printed the tunic patterns at home and took them to Kinko’s to be enlarged. I also bout tons of linen! 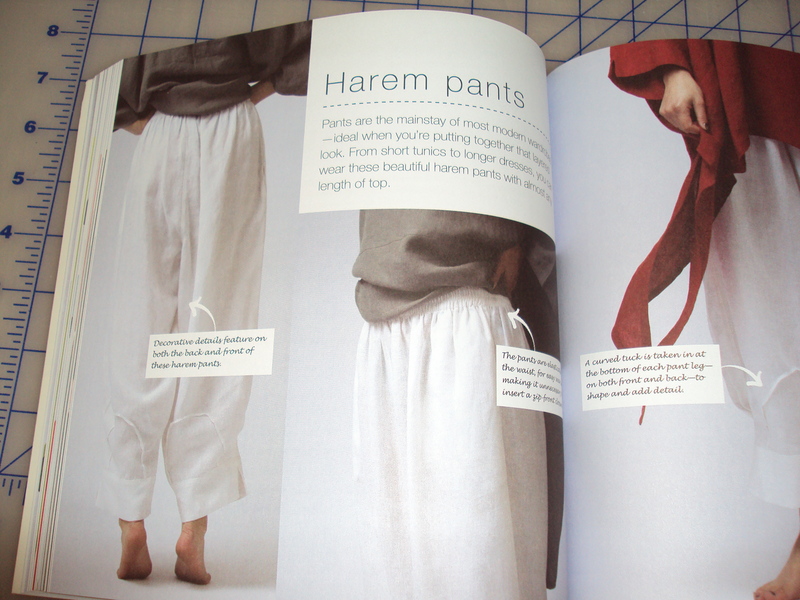 I noticed that all of the clothes in the book are lightweight linen. Sorry you had an awful time with this. You should try it again. You’re right. I should try another garment. HELP! I’ve printed off the pattern pieces for the Vest and have just started taping them together on the glass patio sliding door. It’s not going to work to match the numbers in the corners of the pages (if I do that, the pattern pieces don’t align). So, do I just match up the pattern lines, w/ no overlap? Hi Ann, I had no success with the patterns in this book and gave the book away. I really liked the designs but they were so poorly drafted that this wasn’t worth my frustrations. However, if you are going forth with making up one of the patterns – I salute you. You are much braver than I. I would walk the sewing lines (no overlap – overlap would be the seam allowances that you would need to add). When I say walk the seam lines, you could pin the together the pattern along the sewing lines to make sure the lines do match. Many times a pattern sewing lines will not match when the pattern is flat but will ease together when pinned. I would also recommend sewing up a muslin first rather then jumping into the fashion fabric. I wish you the best on the garment. 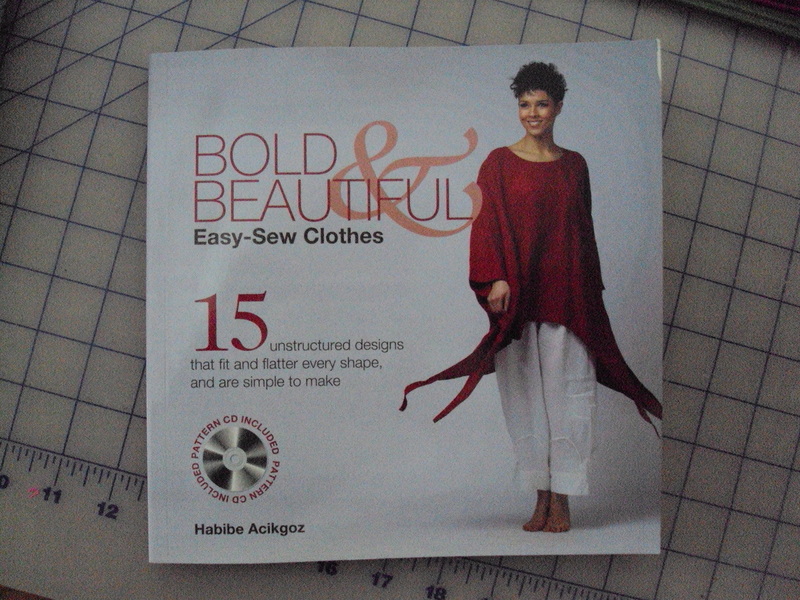 I wish I had the patience and the time to sew up some of the garment in this book, but like I said – I gave up.